Answer: That’s a good question, since the idea of the Sun burning through the clouds is well established in meteorology. But when that does happen, an entire later of clouds (or fog) is generally “burned off” over a wide area. It’s not like a single hole is burned through a specific spot in a cloud, though sometimes it looks like that’s what’s happening. The video above shows an example of what I’m talking about. This is an asynchronous time-lapse video. Most of the frames were shot at 1 minute intervals — I was planning to get a time-lapse of one of our beautiful Arizona sunsets. But when the Sun started breaking through the clouds, I shot frames at 10 second intervals. That’s why the clouds change slowly in some places, and rapidly in others. Then I edited the time-lapse to focus on how the Sun briefly appeared through what seems to be a solid cloud bank. In fact, the hole was already there. And for just 4 frames (40 s), Sun-hole-camera were collinear. Specs for photo geeks: Canon EOS 20D, standard 18-55 mm lens at full zoom, ISO 400, ƒ/16, t=1/500 second. This is probably similar to what you saw, when Sun-hole-you were collinear. But in both cases, the Sun wasn’t “burning a hole through the clouds.” It was merely taking advantage of an existing hole, and just peeked through for a few seconds. When the Sun really does burn off a layer of clouds (or fog), what’s happening is that the Sun raises the temperature of the air above the dew point, and the water droplets that compose the cloud evaporate back into invisible water vapor. That answers your question, but it brings up an interesting and closely-related question some other readers have asked. It’s also well within the scope of the title, so I’ll answer it now. Consider this a Sky Lights double feature. High-power lasers are being developed and tested as weapons by the military. There are claims that these lasers have burned holes through clouds. Check out the thumbnail below (from an unnamed conspiracy theory website). It’s supposed to show two holes burned through a cloud by a laser. Looks believable, but there are some problems with that claim. Laser weaponry researchers have found that, in clear air, a high-power laser can effectively hit and disable a rocket, cruise missile, or aircraft (including drones). But only in clear air. If there’s a cloud between the laser and the target, the micro-droplets of liquid water will scatter and diffuse the laser beam. That renders the beam ineffective unless the cloud is very thin or diffuse. 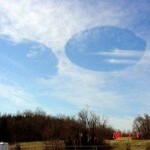 More than likely, the thumbnail shows what is called a fallstreak hole. For more about exactly what a cloud is, see my June 24, 2013 post: What Clouds Are. So yes, a high-power laser could burn a hole through a static cloud, evaporating the micro-droplets of water, and eventually reaching the other side. But it would need to run continuously for a long time. Thinner clouds = shorter burn times. But the resulting hole would only be about the diameter of the laser beam. If the cloud is not static, and contains active updrafts, downdrafts, or shear, any evaporated micro-droplets would be quickly replaced by new ones. Laser beams can be shaped by optics into a larger diameter, but that reduces the energy concentration. The holes in the thumbnail look to be maybe 100-200 meters diameter, so that would take a very powerful laser. It requires 2.26 MJ (megajoules) of energy to vaporize 1 kg of water (water’s latent heat). And that applies only if the water is already at its boiling point. So the micro-droplets in clouds would have to be heated first, and that takes another 4186 J/kg/°C. How much water is in a cloud? Probably more than you’d guess. Again, see my June 24, 2013 post and you’ll understand why it takes so much energy to burn through a cloud, whatever the conditions. But of course, the Sun does that routinely, especially with morning fogs (which are, essentially, ground-level clouds). The reason a laser and the Sun act on clouds differently is less a matter of energy, and more a matter of concentration. Our Sun acts pretty much uniformly over continent-sized areas. And it puts out energy that arrives at Earth with a flux of 1361 J/s/m2, over as many square meters as it hits. That’s why clouds sometimes evaporate.